At the outset of World War II, the Nazi Kriegsmarine didn’t just deploy their merchant raiders and U-boats, but also tasked capital ships with the destruction of Allied shipping. One such ship was the Graf Spee, a pocket battleship constructed during the 1930s before Nazi Germany renounced the provisions of the Versailles Treaty. Germany’s pocket battleships were designed as a re-incarnation of the World War I battlecruiser concept – better armed than heavy cruisers and faster than battleships. The strategic concept was that each ship could operate independently against Allied merchant shipping and choose fight or flight when faced with the threat of engaging a warship. The Graf Spee was named for Admiral Graf von Spee who had defeated a British squadron at the Battle of Coronel (November 1, 1914) only to have his squadron destroyed by a superior British force a month later at the Battle of the Falklands. Admiral von Spee was lauded by both sides of the conflict as a brilliant tactician and consummate naval officer and gentleman. After his death at the Battle of the Falklands, Admiral von Spee was quickly enshrined in the then small pantheon of Germany’s naval heroes. In addition to the Graf Spee, Germany built two other pocket battleships – the Deutschland and Admiral Scheer – both of which ended the war as floating artillery batteries and were destroyed in the waning weeks of the war. Commanded by Captain Hans Langsdorff, the Graf Spee found herself in the South Atlantic at the outbreak of the war. Captain Langsdorff and his crew quickly got to work dispatching Allied shipping and sank 50,000 tons of British shipping before being engaged on December 13, 1939 by a trio of British cruisers – Achilles, Ajax, and Exeter. In the subsequent battle, dubbed the Battle of the River Plate, the Graf Spee seriously damaged the Exeter but was herself damaged and Captain Langsdorff sought shelter to perform repairs in Montevideo, Uruguay. Fearing a superior British force had gathered outside Montevideo, Captain Langsdorff and a skeleton crew sailed the Graf Spee into the river estuary on December 18 and scuttled the ship to prevent her from falling into Allied hands. Captain Langsdorff then committed suicide and the crew were interned in Uruguary. 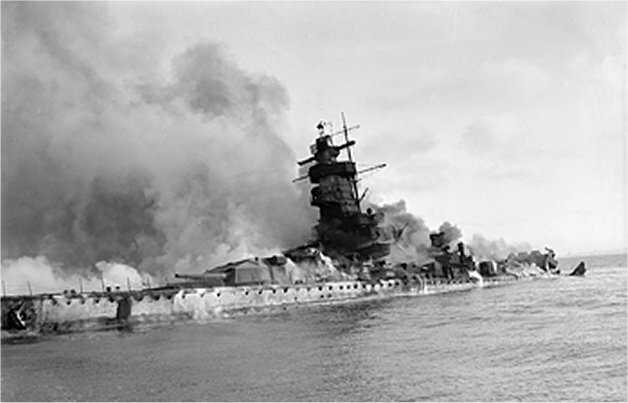 The destruction of the Graf Spee and her limited contributions to the war effort enraged Adolf Hitler who instructed the commander of the Kriegsmarine, Admiral Raeder, to issue an order stating, “The German warship and her crew are to fight with all their strength to the last shell; until they win or go down with their flag flying.” For the Allies, the victory provided a healthy morale boost after the loss of Poland earlier in the year.